Ian Poulter would "love" to be Ryder Cup captain "one day" but hopes it will be a while before that happens. The 38-year-old Englishman is famed for his exploits in the bi-annual contest between Europe and the United States, inspiring his team to victory at Medinah in 2012. "If I was ever asked to be captain, then, yes, I'd love to be a captain of a Ryder Cup team," he told BBC Sport. "Hopefully, I've got another 10 years in me before I ever get asked." Poulter was part of the European team that retained the Ryder Cup at Gleneagles in September. Paul McGinley was skipper then, but Darren Clarke is a strong favourite to take over for 2016. "There are lots of people that could potentially be captain," said Poulter, who talks about his life and career in his new autobiography No Limits. "When you look at the next one in Hazeltine in America, it's very much looking like Darren Clarke will be running as a strong favourite. "He has got a great relationship with the players and he would be a very worthy captain." 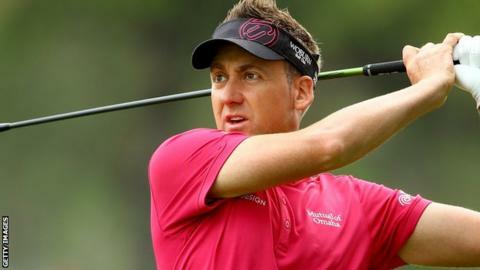 Poulter has endured a difficult season, suffering from a number of injuries, but said he was "very excited for what's coming in 2015". "Battling with three injuries was difficult to take as I have never had that many," said the world number 26..
"To get those in succession, spread out over the season, hindered my performance, but at The Open I managed to start the rehab process properly and the last month has been quite exciting." Poulter has yet to win a major but finished second at the 2008 Open. "When you look at Tom Watson nearly winning the Open championship at the age of 60 a few years back, then I've got plenty of years left in me yet to try and achieve that great goal," he said. He is also targeting an Olympic medal, with golf back on the Games schedule for Rio 2016, having been absent since 1904. "If I play well in this next two-year period, then certainly I can go on and make the Olympics to try to compete for gold," he said. There have been reports Poulter does not get on with 14-time major winner Tiger Woods, but the Englishman played down any conflict. "There is no fractious relationship," he said. "There were a couple of comments which potentially got taken out of context, but there is no personal problem between me and Tiger Woods. "I get on with him fine. I don't socialise with him, but I don't think many other players do either. He is his own guy, he's very quiet, keeps himself to himself, but we don't have any issues." Former world number one Woods has not played since August because of injury and has not won a major since the 2008 US Open. "I'm not sure he will get back to his best, but his best is not required to win golf tournaments," Poulter added. "He just needs that little sparkle in his eye and he's a tough guy to beat."